I really loved the Monster Cookies I baked not too long ago, and although I wanted to make more, I just didn't have the urge to bake. Luckily, I found a recipe for Monster Cookie Energy Bites, which made the perfect after school treat. I love making energy bites. 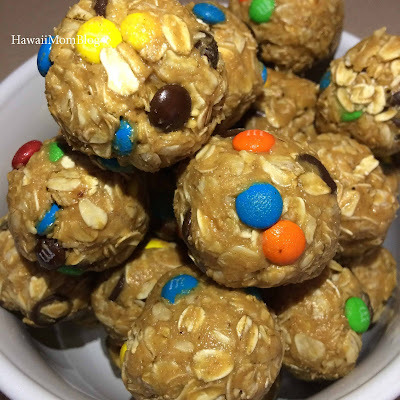 They are easy, no-bake treats to make, and you can make them in all sorts of varieties, depending on the ingredients you have on hand. 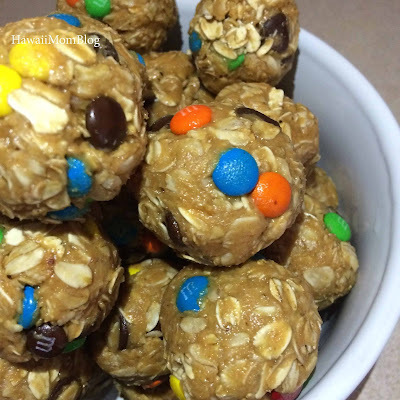 The M&M's in these energy bites turns them into a quick and easy dessert as well! Can be kept in refrigerator for 3 to 5 days, or freeze for 2 to 3 months. You can find the original recipe here on Love to Be in the Kitchen.